The Arctic is changing in response to Earth’s changing climate. Arctic ecosystems that have evolved over millions of years face changes occurring over 25 to 30 years, the average lifetime of a polar bear. And changes in the Arctic’s ice, ocean, and atmosphere will likely catalyze ocean and climate shifts throughout the globe that will have significant repercussions for society. It may be a little late for an “early warning” system, but a consortium of scientists from many institutions and nations are establishing an Artic Observing Network to monitor the changes taking place now and to help predict what will happen over the next century. The ice blanketing the Arctic Ocean, along with extreme weather, have always deterred sustained observations of the Arctic by preventing researchers from bringing instruments to the environment, leaving them there, or getting them back. In particular, to make continuous measurements of the ocean beneath the ice, researchers have realized that they have to use autonomous instruments and find a way to get back data in real time. 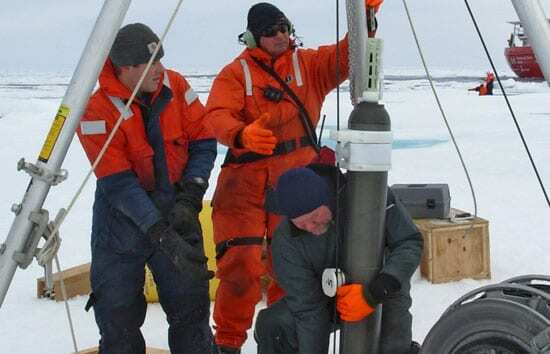 Scientists and engineers from the Woods Hole Oceanographic Institution (WHOI)—led by physical oceanographer John Toole and Arctic research specialist Rick Krishfield—have devised a way to do that, and to put the ice to work for them in the process. They call it the ice-tethered profiler, or ITP. The ITP system consists of several components (see diagram at right). To install an ITP, researchers use an ice auger to drill a 10-inch-diameter hole in the ice, much the way ice fishermen would. Anchored to ice floes, ITPs slowly drift with the natural movement of the Arctic ice pack, measuring seawater properties below. They are designed to last three years, about the same lifespan as the floes that support them. 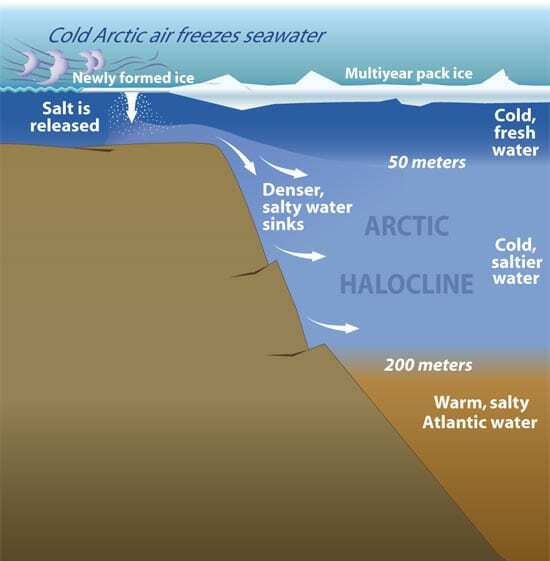 One of the ITPs’ primary research targets is the Arctic “halocline,” a layer of cold, salty water that forms in the Arctic Ocean and separates fresher, colder waters near the surface from warmer waters 300 to 500 meters (980 to 1,640 feet) farther down. Without the halocline acting as a barrier, there is enough heat stored in this deep reservoir to melt the ice cap from below. Physical oceanographers such as Toole, Krishfield, and WHOI colleagues Mary-Louise Timmermans, Bob Pickart, and Andrey Proshutinsky are trying to understand the oceanographic mechanisms that create and sustain the halocline. ITPs will provide season-to-season and year-to-year data on whether the halocline is stable or changing in the face of other climate changes. The scientists are not only concerned that the halocline might weaken or disappear, they also postulate that warmer waters entering the Arctic Ocean from the Pacific Ocean could disrupt the formation of the halocline in the first place. Many climate models indicate that Arctic Ocean ice cover will melt considerably within the next 50 years, so that there is no ice cover during northern summers. Some models suggest that once the ice starts to go, it will happen quickly, perhaps over the course of 10 years. The impacts for the polar ecosystem, regional and global climate, and international commerce would be enormous. 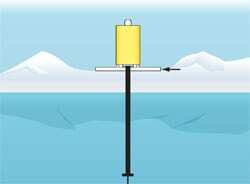 The first ITP was deployed in 2004 in the western Arctic Ocean north of Alaska. It shut down shortly after, a victim of the engineers’ learning curve in the harsh Arctic environment. Two more were deployed in the same region in 2005 and three more in 2006. Of those, two ITPs were recovered in 2007 and will be examined to make engineering improvements. Two are fully operational and sending ocean data back to shore daily from the Beaufort Gyre, a huge circular current in the western Arctic Ocean. In April 2007, Krishfield and colleagues deployed one from Ice Camp Borneo at 88°N. That ITP is drifting southwest with the Transpolar Drift current toward the Atlantic Ocean, sending data all along the way. In August 2007, they deployed three more ITPs in the Beaufort Gyre. With international colleagues, eight other ITPs were deployed in 2007, as the team works toward spreading a network of as many as 20 ITPs distributed over the Arctic Ocean and sustaining them over time. Additional sensors for ITPs are being developed to measure chlorophyll, particles, solar radiation and other important ocean properties that provide evidence of changes in the ocean’s ecosystem. The ITP network is one of WHOI’s contributions to the International Polar Year effort, as well as a part of the multiyear, multi-institutional Arctic Observing Network program. WHOI is working with colleagues from the Cold Regions Research and Engineering Laboratory, the U.S, Naval Postgraduate School, the University of Washington, Oregon State University, the Japan Marine Science and Technology Center; the National Oceanic and Atmospheric Administration; as well as institutions in France, Germany, Russia, and Canada. Collectively, they want to measure what is happening above, within, and below the ice. Any effort to better predict how the planet will change over the next century will benefit all Earth’s inhabitants, including humans. Funding for this research has been provided by the National Science Foundation’s Office of Polar Programs and Oceanographic Technology and Interdisciplinary Coordination Program; the Cecil and Ida Green Technology Development Awards; Woods Hole Oceanographic Institution; and the James M. and Ruth P. Clark Initiative for Arctic Research. When sea ice forms, it releases salt into surface waters. These waters become denser and sink to form the Arctic halocline's layer of cold water that acts as barrier between sea ice and deeper warmer water that could melt the ice.